October 15, 2013 — Man, I cannot believe it's already time for the second installment of this Trick-or-Treating the Web stuff. I do two of these posts every year. The first one's always in September, and it feels like filling up an hourglass. The second, in October, like rapidly emptying it. So instead of just leisurely skimming through the links like in the last Trick-or-Treating the Web, casually bolstering your Halloween spirit click by click, now you need to machine-gun these links, stuffing every bit of Halloween you can into the rest of the season like compressing a popcorn ball down into a denser mass. Because before we know it, we'll be wearing Pilgrim hats instead of spooky masks. 1. A massive list of blog doing Halloween countdowns. 3. On Halloween, Danny Elfman will be putting on a concert of music from the movies of Tim Burton in Los Angeles. 4. An interview with Eric Pigors of Toxictoons fame. 5. 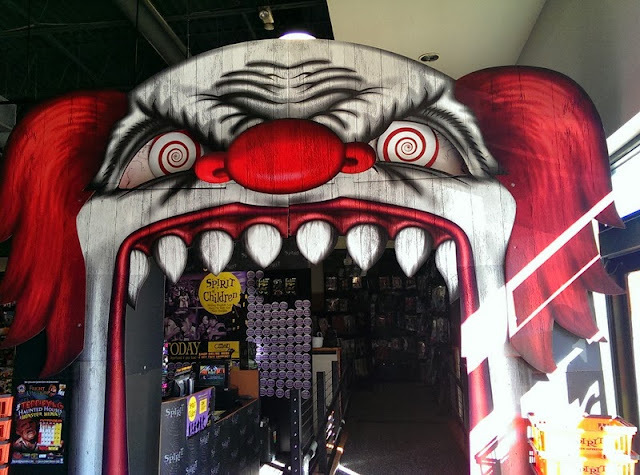 Video walk-throughs of every Universal Studios Halloween Horror Nights maze in California. 6. How do you pronounce Halloween anyway? 7. A Southern Baptist look at The Exorcist. 8. Great pics of spooky forests. 9. A Minecraft rollercoaster inspired by The Nightmare Before Christmas. 10. How to build a giant spider for your Halloween decorations. Well, to dominate your Halloween decorations. 11. The 50 scariest books of all time according to Flavorwire. 13. If there was an ultimate series-spanning 8-bit version of a Friday the 13th video game, this is what it would look like. 15. Thirteen scary places in the ever-scary city of Los Angeles. 16. ABC Family to launch a horror series starring Jamie Lee Curtis and run by Steven Miner. A new kind of family. 17. A visit to the Scarehouse, outside of Pittsburgh. 19. Hey, it's tarantula mating season. 20. The mystery in Bulgaria of 2,500-year-old remains of horses buried standing up. 21. The Haunted History Trail of New York. 22. Behind-the-scenes video of how they made the Beetlejuice snake. 23. A photo essay of the 2013 Eyegore Awards. 24. Dead animals in bizarre positions. 25. Roman skulls found beneath London. 26. VeggieMacabre heads to Korner's Folly, a strange house in North Carolina. 27. What the world would be like if these horror Popsicles were real. 28. This weirdo outed in the mainstream press for living with two plastic skeletons. 29. A video of Halloween news bloopers. 30. Rue Morgue's Halloween issue.